energy from other parts of our lives. It's the law of diminishing returns, honestly. My college economics teacher explained it in terms of potato chips. You are hungry and spot a bag of potato chips, unopened and waiting for you. You raise the first chip to your mouth and the salty smell triggers momentary happiness that your hunger will soon be satisfied by this crispy treat. You bite the chip and a flood of goodness fills you at that first taste -- the crunch, the saltiness on your tongue, the light touch of oils used to fry the potato, and the sound of chewing this treat and sending it to your stomach where it will calm that ravenous feeling you had. You eat another and another. Ten chips later and you are still glad to be eating chips, but the feeling as each is brought to your lips is not the same as that first chip. It's never as good as the first time. Twenty chips later and you are slowing down, getting your fill, and the thrill of the flavor is in the past. If someone were to hand you another bag of chips, you would likely turn it down because your want of chips to satisfy hunger is diminished. Eating chips at that sitting no longer returns to you the satisfaction it once did. The return is diminished. Somewhere along the line, though, our mental indicator to not accept a second bag of potato chips after our hunger is satisfied got broken. We're not hungry, but we might be again so let's accept that second bag of chips into our lives and hold onto it for a while, just in case. Before long, satisfaction of our first need becomes overshadowed by our "just in case" factor. One day we look up, and 10 bags of chips are lined up on the shelf, and we have long ago lost our affinity for them. But it would be a shame to throw away perfectly good chips, right? So we keep them because we believe it somehow shameful to give away perfectly good items that we have purchased with our hard-earned money. It works the same way with shoes. Don't get me started on my shoes. At one time, I owned more than 80 pairs of shoes. I converted the closet in the extra bedroom to a shoe closet, complete with shelves and all the shoe care items necessary for maintaining them. Polishes, brushes, laces, heel taps, and those boot-shape-holder-thingies. It became a monster. Twice a year, I would spend a weekend with my shoes, sitting in the bedroom floor polishing, mending, tending, and reorganizing. Two days a year. Two entire days a year spent with my shoes. Really? Only when I took as step back from the monstrosity of my shoe collection did I see the absurdity of it. It began as small moments of happiness -- buying a new pair of oh-so-perfect shoes -- and slowly morphed into a mindless habit of buying more shoes. The happiness return received on buying a new pair of shoes had diminished. So had my closet space. Several years ago, I was intrigued by the idea of downsizing when I read the book The Not-So-Big House by Susan Susanka. In this book, Susanka addresses the American obsession with bigger-bigger-and-bigger houses (filled with more and more and more stuff) in a step by step walk through the thoughts that brought us to that belief system of bigger somehow being better. I originally bought the book in 2001, after its first printing, and was drawn to the idea of creating a home for the way that you live rather than creating a home for the way your friends or neighbors live. Susanka, an architect, advocates building homes with less square-footage and shifting more funds toward creating well-planned interiors to support the owner's quality of life. Do you need a giant gourmet kitchen when you don't like to cook? Or would you rather have a comfortable library nook off the living room to support your love of reading? In this case, wouldn't a functioning kitchen be enough while you focus designing the perfect reading nook? The average American home is 2,400 square feet (223 square meters) while the average home in the United Kingdom is 818 square feet (76 square meters). Is the average English woman half the size of the average American? No, we humans of today are of relatively similar height and stature. So why can the English live in houses less than half the size of American houses? My scientific answer is simple: stuff. The American culture of "more stuff makes you better" somehow began to overshadow the European concept of enjoying a few good quality items. It was probably the shadow cast from our mountain of ever-growing stuff that did it. Come on, how does 80 pairs of shoes make me better? It doesn't, and it didn't. A few years ago, "the purge" began in my house and is an ongoing process. First to go were about half the shoes, bagged up and sent to a local resale shop where I earned a little cash for the effort. Books were next. Though my love for reading has not diminished, my desire to own every book I liked has. I can now read a book, enjoy it, and take it to the resale shop. I call it, "releasing it so it can bring happiness to another." Only the really really good ones, where I believe I can use as a reference multiple times in the future, can take up residency on my bookshelves. These concepts have been carried to each room of my house, each closet, each drawer and cabinet. Only keep what I truly love, truly need, or truly supports the way I live. The rest falls into The Purge (sell, donate, or toss -- with the majority in the first two categories). And the emotional result is remarkable. Once firmly footed in this concept, I realized that the absence of excess was calming. I no longer had to dust all those books or polish all those shoes. That extra time could be used for enjoying life. Conducting this purge in many areas of my life saved bits of time and energy in many areas. Those small bits saved here and there collected into a rather large chunk of time and energy that I could use elsewhere, somewhere I enjoyed. I learned that living small is the most abundant life I have known. 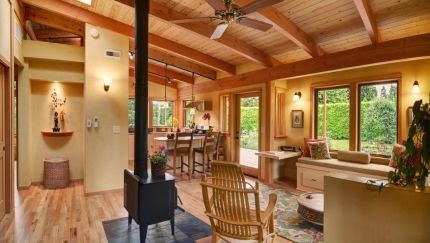 The recent "tiny house movement" which has grown in popularity in the last several years is ripe with good ideas for downsizing the stuff in our lives so we can focus on living our lives. New websites devoted to the topic seem to pop up weekly, and while the idea of a 150 square-foot house on wheels is interesting, it may be too extreme for me. That's the beauty of this concept, though. Each person should design the space in which they live around themselves and how they live. It will not be the same for each person. Some families need the big house, and if that is affordable, I say go for it! Where we need to be cautious is where we are pushed or shamed into creating a living space that fits someone else's life, not our own. Do you believe you have to buy the big house on the hill to show your friends how successful you are? Well, you don't need the house, you need new friends. Today, I look around my house and think, "I don't need this anymore," or "I could do with less of that" which is a far cry from years past of I-need-I-want-I-have talk. My current home is about half the size of the American average, but I could go smaller. Easily. Each day, I work toward that goal. I would love to live in a well-planned 500 square-foot house, built for the way I live, built to support my life as it is. Not my neighbor's life, not my friend's lives, but my life. My life is the only one I'm living. It's the only one I can live. Of all that I have learned in the last several years about ridding my life of excess stuff, the most important thing I have learned is how to rid my life of excess thought. Who cares what others think of my house? I like it. It is small and simple. It is clean and maintained because it is a size I can manage. Who cares if I wear the same pair of shoes to work for two days in the same week? They are good shoes that get me where I'm going, and are not nearly as interesting as the person they carry. Who cares that I do not aspire to live in a big house on the hill? That's not my dream. It may be someone else's, which is great for them, but my dream house of 500 square-feet is just as real and just as worthy. What is your idea of the perfect living space? In your heart of hearts, what is the vision of your perfect space that you have tucked away in your mind? Are you afraid to speak it because of what your friends might think? I understand, but your words and dreams are safe here. Sometimes just speaking them out loud (or expressing them in the comments) can unleash their power to work their magic and propel you closer to them.